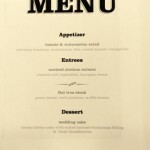 Our clients are from Texas and their wedding is in Honolulu, Hawaii! Check out this beautiful Teal & White combination Wedding Invitation from Checkerboard we helped to personalize for our couple’s wedding in Honolulu, Hawaii for their destination wedding. 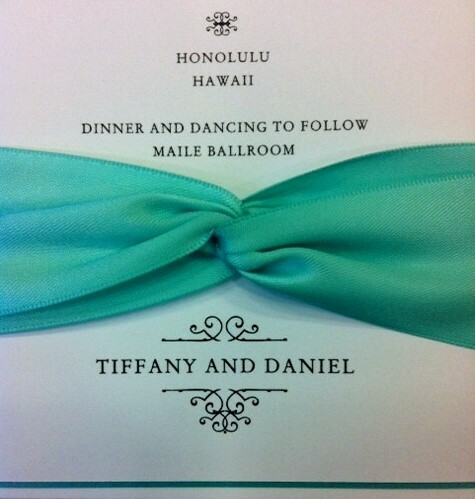 The vibrant, teal, satin ribbon accents the tropical theme of this destination wedding invitation. The bright, teal color of the satin bow is reminiscent of the clear, magnificent blue skies of Hawaii. Although I have only been to Maui, I can only imagine that Honolulu is just as blue as Maui. The above stamp illustrates the San Francisco Palace of Fine Arts Personalized Forever Stamp our couple, Tiffany & Daniel, are using for their RSVP Envelope postage! 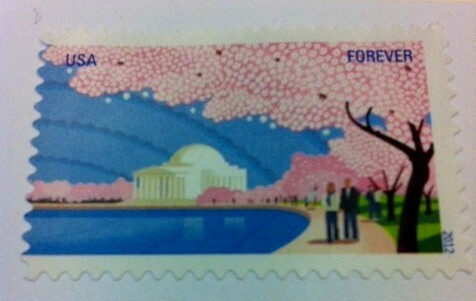 This picturesque “Forever Stamp” is a symbol of our couple being “Forever” Married Happily Ever After. The photo consists of a couple walking by the pond at San Francisco Palace of Fine Arts underneath a Cherry Blossom Tree. The postage is used for their RSVP card Envelopes. The San Francisco Palace of Fine Arts is a popular place wedding couples visit for photo shoots. The backdrop not only offers old world columns and trees and flowers it surrounds a pretty pond with ducks. You can see more of our Checkerboard Selections and other wedding invitations on our website and blog! 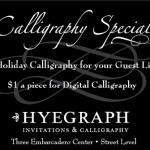 If you would like us to help you with destination wedding invitations, envelope addressing or any other stationery services, please don’t hesitate to Email, Call, or stop by our Store conveniently located near the Ferry Building right in the Financial District in Three Embarcadero Center across from the Gap, Anne Taylor and See’s Candy.